TL;DR We attended Facebook’s Partners Bootcamp at their EMEA HQ in Dublin. A full day of sessions gave us an idea of the direction that Facebook is headed towards in the next two quarters. Here the most interesting points. Main Trend: Stories. Stories. Stories. There was probably not a single speaker who didn’t mention Instagram Stories during their presentation. Even when we spoke with Facebookers directly, their enthusiasm for stories shone through. Moreover, there’s a good reason for their keenness because the users are just as excited. Instagram launched Stories in August 2016, and within the first two months, they attracted 100M daily active users. One year later, in November 2017 stories had acquired over 300M users which makes it one of the fastest most adopted products. Faster than that is probably only Whatsapp Status which has already over 450M users. What should you keep in mind when creating an Instagram story? Use carousels: A new ad format that allows you to post three stories right after each other which allows you to capture more attention. Create vertical content: While IG is beta-testing “non-9:16 creatives” (to allow advertisers using classic single image creatives), vertical content is what gets the most engagement. 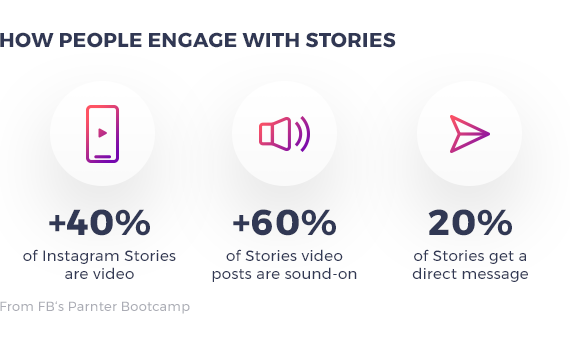 Capture attention quickly: You’ve got around 0.25s to grab the users’ attention and make users stay to watch your stories. Use fast videos and play with light and sound. Know your objective: Optimize stories for the right objective to get engagement or other desired actions. E-commerce continues to be the critical vertical when it comes to performance advertising on Facebook. Also, as you probably noticed, it all will be about feed-based ads and videos. Product catalogs will, therefore, become crucial for both paid and organic activities. Emily Wilson, Product Growth Manager for E-commerce, introduced few features that will make technical implementations easier for all size e-comms. By implementing microdata on your website, you can already create product catalogs without having to build an XML feed. Very soon, Facebook will introduce support of multi-country catalogs which will allow advertisers to automatically customize their ads by attributes such as language, currency or apparel size. Facebook will also significantly improve overlays by allowing advertisers to use advanced templates as they might be used to do with partners like ROI Hunter that has advanced templates and an editor. As video is expected to be almost 80% of all mobile data traffic by 2021 and 79% users claiming that they would rather watch a video to learn about a product than reading text on a page, the obvious next step in dynamic ads will be video (we already started working on dynamic video, read more here). Dynamic video ads might be available later this year. 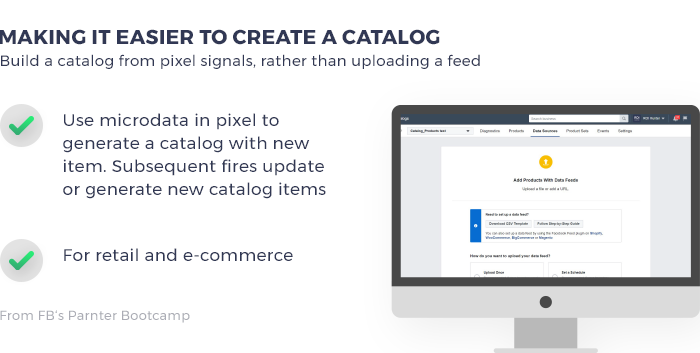 Facebook is also planning several improvements for collection – an increasingly popular ad format for e-commerce advertisers. Tabs in canvas (a full-screen experience which opens once a user clicks on your collection ad) should simulate a paper catalog experience and will be available via API very soon. Altogether, it seems like an exciting time for Facebook, Instagram, and marketers as a whole. So, what do you think about these new trends? Let us know in the comments. Despite Stories’ impressive adoption rate, businesses haven’t yet embraced the format. E-commerce continues to be the critical vertical when it comes to performance advertising on Facebook.